Don't you just love coconut cupcakes? When I was growing up everyone in town, except my mother, was using the popular brand of sweetened coconut. Ever look at the label? Besides added sugar and water, it contains propylene glycol and sodium metabisulfite. Well, I'm not having any of that! I make my coconut cupcakes with organic unsweetened shredded coconut and less sugar than usual, but even my "sweet-tooth" friends like them. Like the Small-Batch Chocolate Cupcakes I posted last week, this recipe can be stirred up quickly by hand and makes exactly six generously frosted cupcakes. My Cuisinart convection toaster oven easily handles a 12-cup muffin tin, but even if yours has a smaller capacity it can likely handle a 6-cup tin. If you don't have a toaster oven, you can pop a little batch of six cupcakes in with whatever else you've got going in your regular oven. Since there is no water added to the organic unsweetened shredded coconut, I stir the coconut into the melted butter and give it a few minutes with the wet ingredients to soften it just a bit before adding the dry ingredients. I'd love to hear your comments on cupcakes, coconut, organic, food additives or whatever's on your mind! 1 Preheat oven* to 350 degrees. Put standard paper bake cups in one 6-cup standard muffin tin. *I use a Cuisinart toaster oven. 2 In small bowl, whisk together flour, baking soda and salt to "sift." 3 In 1-quart glass measuring cup or bowl, melt butter in microwave. Whisk in coconut, then sugar. Add egg, milk and vanilla extract; whisk vigorously for about 30 seconds. Add flour mixture and whisk vigorously for another 30 seconds. 4 Using a 1/4-cup measure, fill the bake cups. Bake at 350 degrees for 18 to 20 minutes, or until they test done with a toothpick. 5 Immediately remove from pan and cool on wire rack for an hour. They must be thoroughly cool before frosting. 6 In 1-quart bowl, with a hand mixer, cream the butter until smooth. With the mixer on low speed, gradually beat in the powdered sugar and salt. Scrape down the sides of the bowl. Add the vanilla extract, rum and cream or milk; beat on high speed until frosting is light and fluffy, about 5 minutes. You will likely have to add the liquid ingredients before adding all the powdered sugar. 7 With a pastry bag fitted with a 2D tip or a 1M tip, pipe frosting on cupcakes. Stunning photos and a fabulous recipe Jean! Karen, thank you so much! Great with a cup of Earl Grey, which I know you like! Thank you, Dom! *Yours* is really gorgeous! We are crazy for anything coconut! These cupcakes look glorious, Jean. Angie, thanks. I've been making coconut *every*thing lately! Thanks, Gingi! I do, too, but so many people love their chocolate! I christen this recipe “Paradox Cupcakes.” It’s this way, Peter Paul Mounds gave coconut a bad name, and the only kind of coconut I like is fresh in the shell or the stuff I fry with shrimp. And as for the rum-butter frosting, I can’t even sniff rum ever since living in the Virgin Islands for a month with no money mucho years ago and living off rum-and-colas ($.25) or a jug of Old St. Croix for $.90. On the other hand, I love Butter-rum lifesavers and Werther’s candies. So, Paradox Cupcakes. If I ever get stuck on a Caribbean island again, I’ll with up a batch according to your specs. Well, Sully, you *could* make these with fresh coconut you grate yourself. And leave the optional rum out altogether. I don't think I could drink a single rum and coke, let alone a steady diet of them -- that would definitely put me off rum permanently! Oh Jean, I am a sucker for vanilla cupcakes, and when you add rum and coconut to them I can't resist! I love that you are doing these small batch recipes, too! Sue, these small-batch recipes are a product of my laziness! I'm eliminating every step, tool and minute I can! These sound so delicious. Coconut and rum are a great combination. Your post had me rummaging through my cupboards to see if my coconut has those additives. I always buy unsweetened. Well, I put the coconut into a mason jar so the bag is gone. But I did find some organic coconut flakes that I like to nibble on! Lorrie, thanks! I hope you'll whip up a little batch soon! I can almost smell those baking, Karen. I'm not too attentive to those organic foods, but maybe should be. I'm okay with coconut, but really prefer lemon or chocolate flavors. Have a wonderful weekend. Jacqueline, that's what's so great about my small-batch cupcake recipes. I've developed them to be quick and easy as well as small, so you don't have to spend a lot of time and effort on something only one person in the family likes. Thanks, Linda. I love lemon, too! With foods coming in from all over the world now and more and more chemicals being used, I think we have to pay more attention than ever in order to have safe and wholesome food. Jean--Growing up we were always given our choice about birthday cakes. Mine was always lemon meringue-shredded coconut cake. As my birthday is next month, I will celebrate with a batch of your coconut cupcakes with lemon meringue-shredded coconut topping! Thanks, Sue. Wow, does that ever sound good! I do love lemon. I'm totally with you on using a little less sugar. So many recipes call for a massive amount and even though I know sugar is imperative in some things, often I think why is there that much? I often cut the sugar a bit and notice no blandness - and this is coming from someone with a major addiction to sweet baked goods. These cupcakes look and sound beautiful. Just perfect. Thank you, Laura! My sticky toffee pudding, for example, is plenty sweet, yet most people put waaaaaay more sugar in it. No need. Cutting back on the amount of sugar as you do, you should do fine with your baking addiction! Thanks, Tony! There's enough for two for each of you. Oh my! My husband is a huge fan of coconut and in fact I recently bought a recipe book full of coconut ideas (haven't tried any yet, sadly). Thanks for the Earl Grey suggestion, too: that sounds perfect. Pauline, thank you! I've got a couple of other super quick and easy coconut things posted: a macaroon- (not macaron-) like cookie, Kokoskakor, and Magical Coconut Pie. Hi Jean! YUM! They look so pretty. I definitely need some cake/frosting tools. I've been making lots of family birthday cakes. Your cupcakes and frosting are beautiful! Thanks, Pom Pom! I have tons of cake decorating tools from back in the day when I used to do a lot of it, but I've gotten so lazy :D I rarely use anything but these two tips or my small or large offset spatulas. I love coconut everything and I usually buy the larger organic flakes. I look forward to serving these cupcakes one day this week! Thanks, Maureen! Hope you like them! I get those big flakes, too; they're great in certain things. I like the fine shred for cakes. 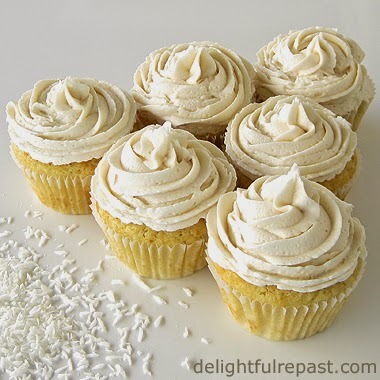 Oh my - you are so speaking my love language with these Coconuts and Rum Buttercream! That crazy-talk delicious! Kristi, thanks so much! If you like chocolate, check out last week's small-batch chocolate cupcakes. These look so good, Jean! 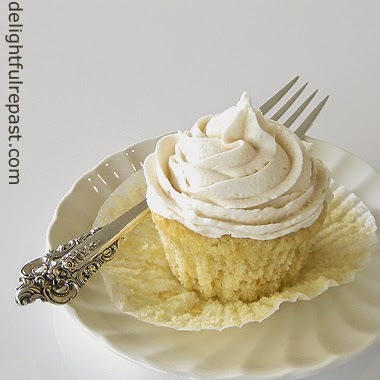 Rum buttercream frosting...yum! Sending lots of foodie love your way! Thanks for linking up with us at #FoodieFriDIY! Pat, funny you should mention that. I've had that "eating plastic" sensation when eating that popular brand of coconut I referred to in the post -- the sweetened coconut with added chemicals. But I don't get it when eating the organic unsweetened shredded coconut; it has an entirely different texture. This looks SO good. I'm going to get my husband to make these! He loves to cook, me not so much but one of my guilty pleasures is visiting cooking blogs or "liking" cooking blogs on FB. thanks for your visit. Love your blog. Sandy, thank you. I hope you'll find more things at Delightful Repast for your husband to make for you! Adding some toasted coconut on top is delicious too! Thanks, Letricia. Ooh, yeah ... toasting coconut makes it an entirely different flavor, doesn't it?